We all know Black Widow is Russian in the comics, so here's a question for you to debate: is she at all Russian in the movies? Former spy and deadly assassin Natasha Romanoff may have red in her ledger, but Black Widow plans to settle accounts! So, brief aside, here: there's currently a storyline in the comics (in Uncanny Avengers, specifically), where Captain America is pissed off at Wolverine because he just found out that Wolverine is a killer (apparently Steve is the most naive guy in the world). Sorry, Rick Remender, but that's idiotic. Cap's a soldier; he's killed. Iron Man has killed. Hulk has killed. Thor has killed. Hawkeye kills all the damn time. The Avengers, as a team, voted to kill the Kree Supreme Intelligence after a battle - and they carried through! Black Widow has been a member since issue #30, has led the team in the past, and is still a paid assassin on the weekends! So why, exactly, are we supposed to side with Cap about Wolverine? It's like those people who can't stop crying about Man of Steel because they think they understand Superman when they don't. Black Widow didn't get a 6" figure in the Avengers line, but it certainly seems like this figure is attempting to make up for that. Straight out of the package, she's clearly a Cap 2 toy, because she's got the straight hair seen in all the ads so far; but the figure also comes with a second head, featuring the shorter, curlier haircut only seen in Avengers. Now all we need is a 6" Mark VII armor and we'll finally have the full team! The likeness is good but not great, and is the same on both heads - no change of expression or anything. The body is entirely new. I've previously admitted that as long as it's black, one movie costume looks pretty much the same as the next to me, but this one could easily pass for either film. The sculpt is very intricate, and won't have a lot of re-use potential. Her costume is constructed from a lot of different panels, and there's a fine mesh texture on some of them. There are small wrinkles around her back, and all the straps and belts of the costume are sculpted on - including the hourglass-shaped buckle that is the only vaguely superhero-ish thing about her. She's got her trademark bracelets, a large zipper up the center of the suit, and separate holsters glued to her legs. There are straps running from the holsters to her belt, but so that they don't interfere with the articulation, the straps actually just stick up from the holsters and don't actually connect to the belt at all. And it's a good thing, too, because her articulation is as good as any Marvel Legend: hinged rocker ankles, double-hinged knees, swivel thighs, balljointed hips, balljointed torso, swivel wrists, swivel/hinge elbows and shoulders, and a balljointed head. 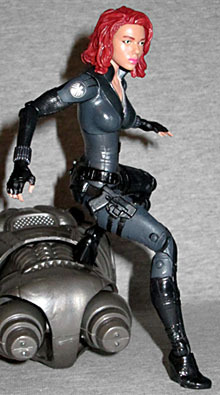 Okay, "almost" as good as any Marvel Legend - her wrists are just swivels, with no hinge. What the heck? That's not good. She also doesn't have any accessories, which is similarly not good. She's got two pairs of hands - one open, one with the trigger fingers extended to hold guns - but she doesn't come with any guns at all. Seriously, that's disappointing. I'm glad we got the Avengers head, but I speak for everyone when I say we would have gladly traded away the open hands for guns that weren't permanently sculpted into the holsters. Widow's new costume apparently adds a bit of grey to create some visual interest - or Hasbro just went nuts with the paint apps, one or the other. Her zipper, buckles, and the SHIELD logos on her shoulders are bright silver, there are red and black apps on her hourglass, and her bracelets are dark silver. Her skintone is more tan than expected, and her hair has a bit of an orange tint. 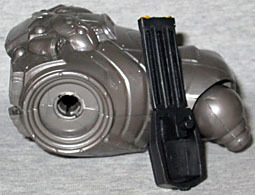 The figure does, of course, include a piece of the series' Build-A-Figure, the SHIELD Mandroid. Being the woman, she gets the central body (it's an economy of plastic thing, we've mentioned it before) and a shoulder-mounted gun. 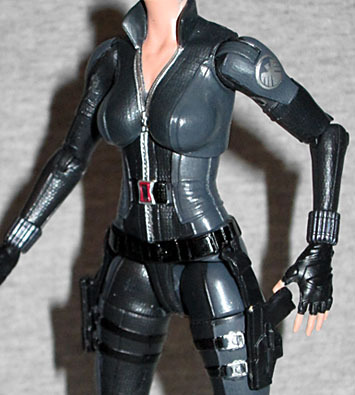 Of course, Black Widow is shortpacked (a case includes one of her, two Winter Soldiers, and three Captain Bluemericas), so good luck ever completing the BAF. 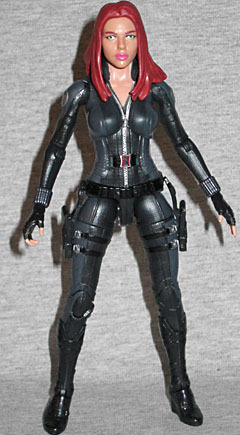 Black Widow is a decent figure, and allows us to finish off our 6" Avengers team, but there were a couple weird corners cut that keep her from being as good as she could be.